Heater Plenum Repair, Seal Replacement Kit & Replacement Heater Core. This was an unexpected mini project I hadn’t planned on, perhaps if I had done my homework I would have realised this was a no brainer. Instead I am the one with no brain as it caused me loads of grief. So, I re-wired the car to the point that it would start, put the new radiator in, repaired the hacksawed transmission cooler pipe and reattached it. I started the car up a few times and was feeling rather pleased with myself and thinking – there’s nothing to all this restoration lark. Oh, just how WRONG was I? As a few friends are interested in the car and the progress I am making they decided they wanted to come round and see it, and most importantly hear her growl. As there are no exhausts on her at the moment it’s a bit loud to say the least, and who would turn down any excuse to start the symphony of a v8 289? I turned the key and she barked like the Cerberus guarding the gates of hell. So there they were, standing by the engine and looking in and taking in that aroma of raw petrol and oil, while having the audible sense of both ears being smashed with an auditory sledge-hammer! 🙂 All was well untill the mother-in-law came out to put rubbish in a bin and said “Is that water supposed to be there?” Then retreats into the house shaking her head. At this point panic sets in, I go cold and turn her off. Sure enough, with my ears still ringing, there was a river of blue antifreeze running down the path. I needed to check from where; Under the hood – nothing. Inside – nothing visible. Underneath just in front of the seat bolt holes a steady stream of water! Thinking to myself there are no pipes there, so it has to be inside. I opened the passenger side door and felt the carpet, yep it’s wet, that unmistakable sticky feeling of antifreeze. I pulled up the carpet and there was a puddle running out of that big oval drain hole in the floor pan. Why is that hole there, what purpose? Or have I answered my own question? I looked underneath the dash at the heater core pipes, not loose. Felt the heater case join – yep, it was persistently pouring out if you get me? It can only mean one thing. The heater core. Back to the hood, trying to not panic still and spray my face with hot water from the radiator, I had to release the pressure and grab a bowl to drain the radiator. I was more hacked of that I had put in best part of £15 worth of antifreeze in her only to watch it run down the drive. While she was draining out, there was time to dry it out and mop the mess up. about the time this happened it was in the summer so the sunshine dried the carpet out and the inside within a couple of days. Sure enough, there was plenty of posts on the net to say that these cores go on a regular basis. They also say that while you are at it replace the plenum and the seals, and the cables and the dash kit etc etc. I had to make decisions, the first was dead simple. 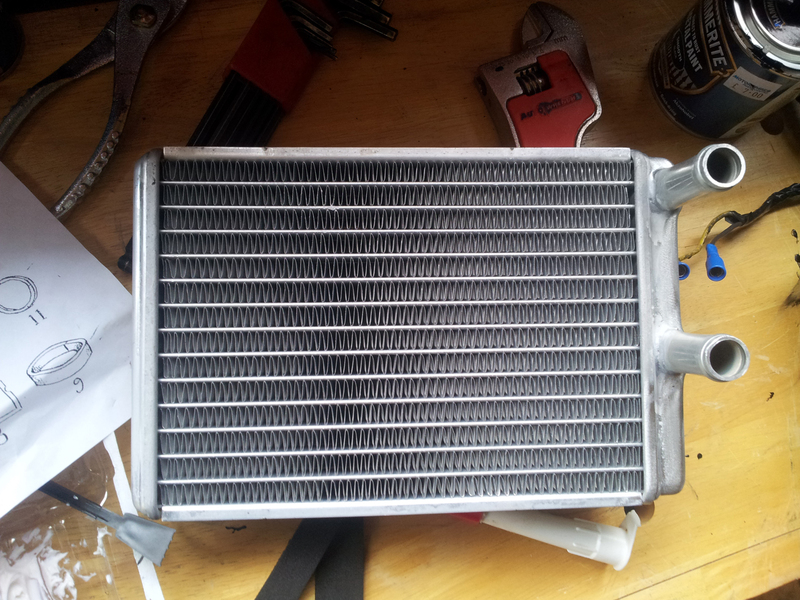 The heater core, a nice new all aluminium job from eBay. Second, the seal kit for the Plenum. thirdly a little bling for the hood, my blue silicon heater hose. Yeah, Yeah, Yeah, it’s not stock I get all that, but I have a Pertronix Ignition Kit with Blue silicon 8mm HT leads. They will look great next to the polished chrome header I will put on it! So research completed. Pay for it and wait to all turn up. Now there are some great walk throughs on how to do this on the net, I am not going to give a step by step process, but I will touch on a few steps I did at the time. I will try to show what my heater box and plenum looked like as it’s part of the restoration of my car. As ever I will place links at the end of the piece if you need the walktroughs, because I care for my readers. Me? I did it like a man does, with the Haynes manual open following the process for a few pictures, in the end I did it my own way. (Which in the end wasn’t to far away from the book). I’m lucky at this point, as the first job I did was to take out the driver seat of the car as it wasn’t bolted in and the base had collapsed and needed fixing. My friend Will got hold of it, re-welded i. and sprayed it up for me. The seat was never put back in for the simple reason that I could work on the wiring for the dash and the fuse box. As a result I could lay across the floor get access to all areas and just get poked by the gear shifter instead! From the engine bay: There needed to be a disconnection of the heater wires, This wasn’t a problem as the re-wire hadn’t got to that part just yet. Four nuts to undo for the heater motor, they were well and truly rusted on, there was also an earth strap that more like a well-worn piece of knickers elastic rather than an important part of the circuit. I managed to sneak of and purchase one of these from a local auto store ready to replace the old one later, all while the wife was shopping, and she hadn’t noticed I had gone next door. The block earth strap mounting was cleaned up as well while I was at it. I also had to remove the heater pipes as well, these I later found out had been put in the wrong way round. This indicated to me that this was not the original but also a replacement. The pipes were cut to a dead fit to the block and pump. To be fair, a nice job. Shame it was wrong! Under the dash: I decided that I would undo the heater hose from the block and pull them through the fire wall as I didn’t want any more water all over the place. I undone the cables for the controls and wrapped a sticky label around each to state what it was and where it was to go. At this point I squirted a maintenance spray on the cables to free them up, followed by a few drops of a very fine lubricating oil down the control connections to let it all soak down. The demist hose was next, yes there should be two but I only have one that was split anyway. (Note to self – order new ones!) Then I undone the retaining screws and pulled the unit down and out. I made sure that the hose were gently pulled through at the same time. I was surprised at just how easy this was to get out. Once out I inspected the air hole from the cowling that was rusting a bit, a note to treat that later on was made to be done before the heater case was put back. In the shed: I took the whole thing to an area where I could safely get rid of the remaining antifreeze in the unit. I undone the hoses and inspected, the ends had cracked and perished, in fact they looked like they were ready to go if the core hadn’t of gone anyway. Something was rattling inside the box which worried me. I carefully pried of the clips and pulled the case apart. These were quality materials used for the case at the time were they! Not. The inside of the case was filled with leaves, bits of paper and the missing broken part off the top of case. The rust was everywhere on the metal surfaces and I now had my work cut out to sort it all out. For each of the insides, I cleaned up the rusted metal and applied some heavy-duty railing anti rust paint. I figured that was not going to be exposed to the elements of everyday life and wouldn’t need full anti rust treatment. If it did, it would be cheaper and easier to get a new a new one to be fair. I removed the heater motor and so I could see everything. I found the broken bit of case that fits in the large rubber ring at the top wedged in a crack. You can see from the third picture the old core just on the right. All exposed and rusted metal was treated as was the mouse wheel. The mouse wheel got a spray of straight to rust Rustoleum before I put any of the seals in place. The seal pack: This was from eBay, It had all the areas pre cut and ready to apply. The single sheet of paper showed where the foam seals were to go and the more substantial rubber ones as well, it wasn’t rocket science to be fair so didn’t need any words to it. The only thing I need To complete my little project was glue to stick the seals or foam sheets on. Annoying as this was, I used some PVA glue on the metal surfaces only and slid the seals into place after a few test runs to make sure all was OK. The PVA glue dries clear and will peel of in a rubbery lump if I needed to at a later date. While getting ready to check the trap door I noticed that it didn’t shut properly as the latch was all bent out of shape, this was nothing that a pair of pliers or two wouldn’t sort out. Now it shuts and seals fine, sorted. The pack all fitted fine and there was nothing I had to do with it like trimming it to fit. In that respect it got full marks, was it worth the money? I didn’t think so. A bit expensive for what it was, maybe $25 then yeah a good deal. After a few days of rubbing the metal down treating and painting it was time to for the seals and repair the cracked part of the case. To fix that I used a heavy-duty two-part plastic mix glue. It set hard and held in place well. Sorted. Here are Some pictures of the seals in place, it looks almost new. The mouse wheel was a pain so I sprayed that up after I fine wire brushed the worst of all the rust off. The housing for the motor also got its fair share of treatment before the mouse wheel was put back into place. All I had to do was put the new heater core in place and seal the case back up. New Heater Core – instructions for the seals can just be seen on the left. This sounded simpler that it actually was. The seals obviously had more padding around them now so the case did not go together as easy as I thought. Making sure I didn’t crack the case I pinched together with a large pair of grips and flicked the freshly painted & treated clips over the lips of the case. Replace the outer rubbers and then the put back together again. Job done. The plastic plenum – oh dear, how cheap is this bit? The part is quite fragile and cleaned it up as best as I could. I have found out they are not that expensive to buy. (Not that I’m surprised mind you), maybe I might treat myself to a new one eventually. But as the plenum will sit behind my factory aircon blowers it won’t be seen. So I wasn’t to worried it wasn’t sparkly clean. So for anybody out there shocked by the blue heater pipes – see, I do try to use the original stuff where I can. The Car: At the beginning of this piece I mentioned that there was a bit of rust in the cowl area. Before I put the completed Plenum back in, I treated the rust with the POR 15 treatment. This should stop any further rusting and strengthen up the area. The earthing strap area was cleaned up and moved higher up the heater motor bolts to stop it being to low down, and gunge getting on the strap. I bought as plastic coated strap in order to keep it as fresh as possible. I would be mounting the strap to the firewall with a nice fresh clean piece of metal. 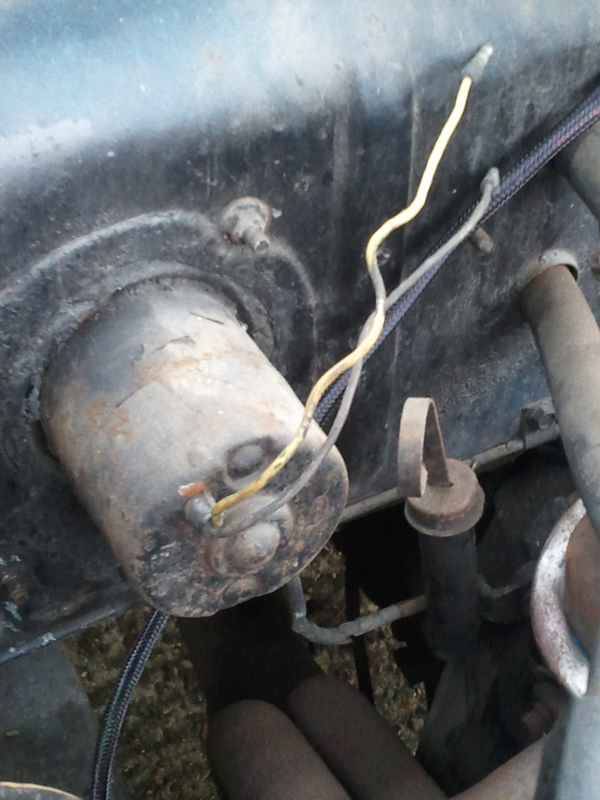 The silicon hose were clipped into place on the heater core and pushed through the firewall a bit at a time. This was done for a reason that I knew the clips were in the right place and done up tight. That way I didn’t have to mess around underneath the dash to try to do lose clips up. Before you ask, yes I did make sure that the clips were in such a position that I could undo them if I had too. The hoses were pulled and laid out on top of the rocker covers ready to fit to the block and the water pump. The heater box and plenum was put in and screwed back up into place making sure the large rubber seal seated fully into the cowl. The marked up control cables were next and fitted onto the plenum and tested. As I had also marked up the clamping positions as well before the disconnection, the cables all moved fluidly now and go to their full extremes without any issues. Back under the hood: The pipes were now plumed in the correct way round and cut to the length required. I allowed an extra inch instead of a dead fit to allow me to cut the frayed end for what ever reason if I had to and use a flesh bit of hose to clamp up. The last job was to mix the antifreeze up and refill. I did this over a couple of hours to allow the fluid to settle in the radiator and the block. Start up: I started the car for a short while and run around checking everything to make sure all was OK. I let the levels settle again and topped up the fluids. Job don. It worked, the levers and doors open and shut in the heater box, the leak has stopped and there is no air locks in the pipes now. The seals look to be doing their jobs. The dashboard has been treated underneath with anti rust paint as well, which could well have been a missed job project. So in fact I see it as good thing it happened now. I would not have been very happy if the Core had gone over my new carpet (yet to purchase) while I was out driving. Since I have progressed further with my wiring I have since connected up the heater motor and it work. It’s not what I would call quiet, but I wont be able to hear it as the windows will be open while I conduct that symphony of hundreds of horses screaming to be let loose from under my right foot! Rating – This should only be for my performance here. Yep, I replaced it all and now it’s fixed, top marks. But, marks removed for not checking in the first place that the heater core was OK. Again after my research I discovered that a lot of sensible people pressure test their new heater core before fitting. I didn’t as I knew nothing about that at the time. So I now have that little nagging doubt in my mind – will it go again once I give it some stick down the road????? So marks of for that too, and suppose I could have done it quicker, if I had read all the section from the manual. The extra expense of more anti freeze, and the embarrassment I caused myself at the time causes a personal rating on myself not to be the surprising and of course expected 10 out of 10. Pleasure. Thank you for visiting. I’d rather stick myself with a sharp object than replace a heater core. Had the same experience with my ’62 Impala. It should have occurred to me there was a reason that the heater was disconnected, but I hooked it up anyway. It took about 15 minutes for the engine to warm up, the thermostat to open, and coolant to leak out of the core (acutually the shut off valve), fill the heater core box, and gush out a vent hole in the top, causing a green waterfall under the dash. Yuchh. A horrible job. Now, you don’t have to worry though! I am fully with you, it was a real pig but I was more hacked of about the fact that my antifreeze was running down the path. Still its done now so it should be ok for a while now at least. Thanks for dropping by and leaving a comment. iking your site and now following you.